This Labor Day weekend, I'm taking inspiration from the international athletes competing in the U.S. Open and heading to the court for a game of tennis. In a tennis match, players use rackets to hit a rubber ball back and forth over a net. This sport can be played by two people (called singles) or four people (doubles). Although I've never played competitively, growing up I loved helping my hermana practice for her school tournaments and watching mi madre play with her friends. Now I enjoy playing for fun with my husband. This sport is a great cardio workout for all ages and fitness levels! It is a great way to stay active with friends: You need at least 2 people to play this sport, so schedule a match with a friend and catch up as you burn calories. Having an amiga to meet at the court makes you less likely to skip your workout, as I mention in Fitness: 4 Reasons to Add Friends to Your Exercise Routine. It's a fun way to get a total-body workout: Instead of forcing yourself through repetitions of squats and push-ups, get lost in the game while your arms, shoulders, core, and legs work hard to hit and chase the ball. With so many muscle groups working, tennis is a great cross-training option for any sport. Play outside: After working indoors all day, I take my workouts afuera as much as possible--simply being in green space is a proven mood-booster, as I mention in Fitness: 3 Reasons to Exercise Outside. With colder months right around the corner, take advantage of the sunshine and the long Labor Day weekend and hit the outdoor court. Sounds like a fun fitness option! ¿How do I get started? Many parks and community recreation centers have free outdoor tennis courts open to the public, or get creative and use chalk to make your own court in a flat driveway or open space. You will need your own racket, which you can buy new or used online or at a sporting goods store, and tennis balls. Don't know how to play? No hay problema. Teach yourself the basics with these simple rules. When you're ready to up your game, enroll in a group clinic at a local recreation center. Private lessons are a great investment: 2-3 sessions will give you the foundation to play for years! Regular physical activity can help control your weight, strengthen your bones and muscles, and reduce your risk of heart disease, type 2 diabetes, and some cancers. Getting regular exercise is easy when you choose activities you enjoy. Grab a racket and a friend and hit the court to stay healthy this weekend. What will you do to stay active this Labor Day weekend? Walking is not only a great for your health, it is also a way to stand up for what you believe in. The demonstration led to the passage of the Civil Rights Act of 1964 and the Voting Rights Act of 1965 and serves as a model for democratic action. What is most inspirational about this event is that it was made up of individuals with a shared desire for social justice who came together to have a lasting impact on the nation. In honor of march participants' courage, ditch the treadmill this weekend and walk with a purpose. Walk for political change: Exercise your freedom of assembly and join with others to show your support of issues that are important to you. This Saturday August 24, the National Action to Realize the Dream March will commemorate the efforts of 50 years ago and continue the fight for justice. Participants will assemble on the National Mall to raise awareness on unemployment, immigration, gay rights, environmental justice, and other critical issues affecting our nation. What issues would you walk for? Walk to raise funds for a cause: Each year members of my familia gather donations and lace up their tennis shoes for the American Cancer Society’s Relay for Life, a walk which raises money for cancer research and serves as a platform for survivors to celebrate their struggle and families and friends to remember lost loved ones. Walk to remember: Strolling along DC's national monuments inspires me to be grateful for the liberties I enjoy as a result of others' struggles. The 50th Anniversary is a perfect time to check out the newest monument in DC, dedicated to Martin Luther King, Jr. Many pressing issues in our society today require attention and action--including the current obesity epidemic. Today in the United States, more than 1/3 of adults are obese and youth are projected to live shorter lives than their parents. What can you do about it? Walk--not just to raise awareness, but to maintain your personal health. Walking for 30 minutes a day helps reduce your risk of heart disease, diabetes, and obesity, as I mention in Fitness SLIDESHOW: National Walking Day. Take a stand for health by staying physically active, and you will inspire those around you to do the same. When we walk together, we can change the nation. For what cause will you walk or run? As back-to-school season approaches and my teacher's schedule begins to feel overwhelming, I turn to Pilates for an efficient workout that reduces stress. This mat-based fitness program uses small, isolated movements that engage only the muscles needed for each move, fitting a lot of work into few repetitions. Don't be fooled--these tiny movements can really burn! I always notice results after just a few classes. It's no wonder dancers use these isometric exercises to build a toned, lean body. Build muscle: Focused Pilates workouts strengthen your abdominal and back muscles, which cuts inches from your waistline and helps relieve tension that builds up from sitting in front of a computadora all day. Stay in the game: By strengthening core muscles and building balance and stamina, Pilates is an excellent cross training option that prevent injury in the sports you practice the most. Relax: While any exercise can help boost your mood, as I explain in Mental Health Month Fitness: 5 Exercise Ideas to Reduce Stress, fitness practices like yoga and Pilates that align movements with breath increase the oxygen flow to your brain, reducing anxiety. Plus, it takes focus to perform precise Pilates moves, so your to-do list won't even enter your mind. Pilates sounds great! Where do I get started? Meet your amigas for a group fitness class at a local gym or Pilates studio. For a free Pilates session anytime, anywhere, check out a workout DVD from your local library or find an online video like this 30 minutes Pilates workout. While some classes use Swiss balls, rings, and other props to help participants with alignment, many moves can be done with no equipment in your casa. Sticking to a regular fitness routine is a great way to stay centered when stress levels rise. Fit Pilates into your schedule to always look and feel your best. What is your go-to workout when things get busy? 'Tis the season to swap your workout spandex for khakis and a collared shirt--August 8-11 is the 95th Professional Golfer’s Association Championship, where top golfers from across the nation compete in 4 rounds of 18 holes of golf for prize money and prestige. Players use clubs to move a golf ball down a green that averages 400 yards, aiming to get the ball in the hole in the smallest number of strokes possible. Although at first glance this low impact pastime may not appear to provide much physical activity, golf is great exercise. Swinging tones your arms, shoulders, and abs while walking for 18 holes--a 4-5 hour undertaking--is an endurance workout (with added strength training elements if you carry your clubs). Plus, this precision sport demands coordination and focus, keeping your mind in top shape. My mami regularly played golf when I was young and I would occasionally tag along. Although the runner in me struggled with the slow pace, I enjoyed being outdoors and found the repetition calming. In golf, practice makes perfect. The key is developing muscle memory and going through the same controlled motions each time you swing. Not ready to commit to 18 holes? Burn calories with these fun variations of the sport--no country club memberships required! Play 9 holes: If you don’t have time for a full game (like most people I know! ), most golf courses are set up so that players can finish after the 9th hole. Pitch and putt: My husband loves this simplified version of the game. Courses still offer 9 or 18 holes, but each green is shortened to about 80 yards and players only need 2 clubs, which are usually provided at the course. Putt putt: Mini-golf was one of my favorite activities to do with my familia on vacation. Choose a course with fun obstacles to get your hijos excited to get out and play. Driving range: With a bucket of balls to hit into an open field at your own pace, a driving range is perfect place to build upper-body strength and release aggression. Frisbee golf: Also called disc golf, you won’t need clubs or balls for this fun spin on the traditional sport. Players try to hit a target with a cloth frisbee in as few throws as possible. Staying active can help reduce your risk of many chronic illnesses, including heart disease, diabetes, and obesity. Simple changes to your routine like meeting your girlfriends for a golf game instead of dining out makes regular exercise fun and easy and helps your body stay strong. Grab a club and take a swing at it! What is your favorite golf-inspired activity? Take advantage of the final days of summer with a stand up paddleboarding workout. This sport is accurately named: participants stand on a foam board and use a paddle to move through the water. Stand up paddling was surprisingly easy to pick up. An instructor showed our class of 10 how to get on the board from the dock and paddle from a kneeling position. We regrouped 30 yards out and learned to stand up by supporting ourselves with our hands then replacing each knee with a foot until we were up and rowing. After learning to navigate with our oars, the real challenge began. Our instructor modeled how to maintain balance without the paddle and encouraged us to try our favorite yoga and body-weight fitness moves. I was proud to get in squats, push-ups, and a few vinyasas without losing my balance. Get a hard-core workout: Simply maintaining balance on the board works your abs and obliques. Even my fitness-fanatic esposo who initially reported it was "almost too easy" was sore the next day! Step out of your comfort zone: I was proud of myself for staying calm and never toppling overboard. Challenges keep your workouts interesting and give you an uplifting sense of accomplishment. Spend time in nature: Working out on the river as the sun set made it easy to enjoy the moment. Being outdoors is a natural mood-booster as I explain in Fitness: 3 Reasons to Exercise Outside. Don't forget to wear sunscreen! Keep your summer workout cool: Planning workouts in the agua keeps me committed to my fitness routine even when it's hot. It’s a great group activity: Take a class with amigas or rent boards and catch up as you glide over the water. Shared experiences are a great way to strengthen your relationships as well as your muscles. Ready to get started? Many boathouses offer hourly board rentals and a variety of board-based fitness classes. I am excited to go back this weekend for a SUP yoga class! Not many water fitness options in your area? Plan paddleboarding into your next vacation to the lake, river, or ocean to stay active while traveling, as I suggest in July 4th/Holiday Fitness: 3 Ways to Stay Active This Summer. The best way to stay in shape is to exercise regularly, but that doesn't mean doing the same thing over and over again. I stay motivated to work out by experimenting with new fitness activities. Stand up paddleboarding is a perfect end-of-summer adventure that will leave you looking and feeling great. What fitness adventures have your tried this summer? As Tour de France cyclists enter the final stage of the 2,115 mile bike race around France this weekend, celebrate their achievement by giving it your all at spinning class. ¿Qué? What is spinning class? Spinning is a group fitness class on stationary bikes. An instructor leads a 45-60 minute cardio routine that works glutes, hamstrings, and quadriceps, making it a great way to burn calories and get strong, toned legs for summer mini-faldas. Doesn't pedaling in one place for an hour get boring? Nope. Your bike doesn't move, but you do. As class progresses, you alternate seated and standing positions and vary the intensity of your workout by increasing your pedaling speed and the resistance of the wheels. Rotating through these "sprints” and “hills” keeps you engaged and working hard. Added summer bonus: an indoor spinning class is a fitness option that keeps you out of the heat. Be ready to push yourself: You choose how hard you work on the bike and it can be tempting to ease up as soon as your legs start to burn. Don't give up! The class has built-in recovery periods, so give challenging sections your all to keep your heart rate up and increase your endurance. Think about whatever motivates you to exercise or visualize yourself as a Tour de France cyclist closing in on the finish line! Use the music: The rhythm of the songs correspond with the speed you should be pedaling: fast songs for a sprint and slower tempos for high-resistance hills. Focusing on the music helps me keep up even when I want to coast. Come back for more: It may take 2-3 classes to get used to commands and the feeling of the bike. Instructors and music will vary, so try several classes to find a good fit for you. Once you get the hang of it, you might get hooked! Safety first: Take the time to adjust your bike and learn proper form to avoid injury. Stay hydrated and keep a water bottle with you. No spinning classes near you? In Fitness: 4 Ways to Spin Your (Bike) Wheels, I recommend an outdoor bike ride or designing your own spinning routine on a stationary bike at the gym. I add spinning to my fitness routine because it helps me stick to my goals of keeping my legs strong for running and getting regular physical activity. As Tour de France athletes work hard to finish their race this weekend, strive to reach your fitness goals with a spinning class. What do you love about spinning class? Looking for a convenient total-body workout that will get you in great shape for summer? Try a running circuit. A running circuit combines my favorite endurance activity running, which I recommend in Fitness: 45 Minute Run to the Mailbox, and my go-to muscle-building routine circuit training which I describe in Fitness: Four Reasons to Love Circuit Training. How does it work? Jog for 3-4 minutes, break for a few reps of a body weight exercise like push-ups or crunches, then pick up the pace again until you reach your next station or fitness stop. Stop 1: Tree push ups: Work your chest and shoulders by placing your hands against a tree trunk and do 2 sets of 15 modified push ups. Increase the intensity further by using a lower support like a bench, ledge, or the curb. Stop 2: Curbside calf raises: Sculpt your calf muscles by standing with your heels hanging off the curb and raise onto the balls of your feet. Do 2 sets of 15. Stop 3: Bench triceps dips: Get your arms tank-top ready by placing your hands on the edge of a bench with your legs extended then bend and straighten your arms for 2 sets of 10 dips. New to this move? Read up on correct form for triceps dips. Stop 4: Playground pull-ups: Find a stable bar just above your height, grab the bar with palms facing you and do 5 pull-ups. Can't pull yourself up yet? Me neither. It’s okay to jump at the start of the pull-up until you build strength. Stop 5: Walking lunges: Strengthen your quads and improve your balance by doing walking lunges the length of a block or alley. Brush up on correct form here. Stop 6: Stair sprints. Sprint up the stairs and walk down 3 times, or use another challenging stair move I describe in Fitness: Step it Up with a Stair Workout. Safety first: when trying new fitness moves, be sure to ask a professional to model correct form before getting started and always stay hydrated! You can adapt the routine for any fitness level: New to running? Start with a run/walk combination between moves and build up your stamina. Need a challenge? Increase your running time and the number of reps you do at each stop. Circuits keep your run interesting: By breaking your run into smaller sections, stations help you push yourself to the next stop and make the time fly by. Build endurance and muscle: Running is a cardio workout that burns mega calories while strength training can reduce your risk of injury. A winning combo! It's free and flexible: No gym fees or equipment required-- all you need is yourself. What's stopping you? It’s easy to commit to regular exercise when you have engaging fitness routines you can do anytime, anywhere. Add this all-in-one workout to your schedule to be strong and look great all summer. Have you tried circuit training? Will you try a running circuit? Traveling this 4th of July weekend? Don't forget to put physical activity on the itinerary! Build activity into your vacation plans: Skip the tourist bus and walk or bike around to see the sights. Take advantage of a local activity that keeps your body working, like whitewater rafting in Colorado or snorkeling in Florida. 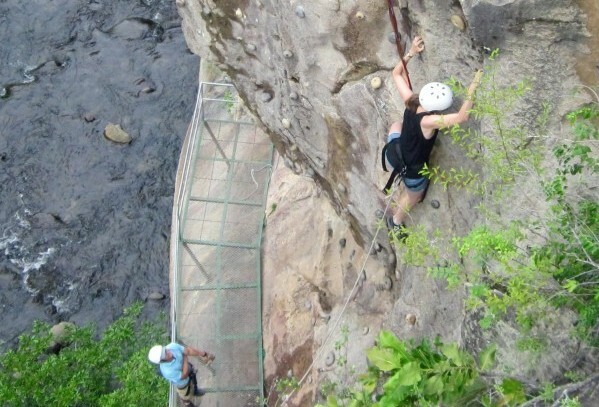 In Costa Rica I was sure to put rock climbing, ziplining, and hiking on the schedule to experience the natural environment while staying active. Plan a workout you can do anywhere: I started each day with a resistance band workout in my hostel room like the one I describe in Fitness: Build Muscle Anywhere with a Resistance Band. A circuit routine like I share in Fitness: Four Reasons to Love Circuit Training is an efficient cardio and strength training workout you can do in a room or a local park. Running is a sport you can do anytime, anywhere as I explain in Fitness: 45 Minute Run to the Mailbox. Take care of your body in transit: Walk around the train station or airport terminal before your departure time, and try these plane yoga moves in your seat. These simple steps performed en route will keep you from feeling sluggish upon arrival. Although vacations are meant to be relaxing, it’s easy to get bogged down by travel logistics. Exercise, a natural stress-reliever, keeps you calm and energized, allowing you to fully enjoy your play time no matter what comes up. Staying fit during your holiday also allows you to indulge on local foods without feeling guilty because you're burning calories. In addition to staying active, be sure to eat healthy on the go by packing nutritious snacks like the options I suggest in Nutrition: 7 Ways to Snack Smart. The key to maintaining a healthy lifestyle is to think about sticking to a regular diet and exercise routine as a rule and not an exception. No matter where you go, whether you're away for a weekend or a month, choose fun and flexible workouts to help you look and feel your best. What fitness activities are part of your vacation plans? Summer is officially here--grab your sunscreen and shades, head to the pool. The American Medical Association announced this week that obesity is now recognized as a "chronic disease" and not simply a "major public health problem." Prevent obesity by staying active all year round and in the warm weather, jump in for a refreshing pool workout. Swim laps: This cardiovascular exercise works your entire body and provides a low-impact workout option prefect for anyone with joint problems. If you're new to swimming, train in intervals until you get the hang of it: swim for 30 seconds then rest for 30 seconds and gradually increase your time moving. Continue this pattern for 30 minutes and work up to 60 minutes. Swimming laps burns nearly the same amount of calories as running-without the heat exhaustion! Check out these tips on how to swim laps. Walk laps: Don’t swim? No hay problema. Water resistance makes even walking a challenge that will tone your core. Grab an amiga and catch up as you stroll around the shallow end. Play: Whether it's water volleyball or freeze tag, water games keep you burning calories while having fun. The best workout options don't feel like work! Water aerobics: Many gyms with pools will offer water aerobics classes, or you can design your on pool fitness routine by combining some of these 8 exercises with a pool noodle and these 7 water exercises. To get the most out of any pool workout, keep your abs tight, use slow, controlled movements and watch your form. Regular exercise is crucial to maintaining good health, yet as I mention in Fitness: 4 Reasons to Try Canoeing this Summer, it can be hard to motivate yourself to get moving in the summer. Water workouts are a perfect solution when temperatures rise--while I may cut my run short on a hot day, I'll stay active in the H2O as long as possible! Wear sunscreen--always--to protect your skin against aging and skin cancer. If you are not a strong swimmer, never enter the pool without a lifeguard present. Don’t run by the pool. Next time you’re at the picina, take a break from working on your tan and work your entire body. You'll feel and look great in that bikini! What is your favorite pool workout?